Ann's first job was teaching school in Kenya; now she considers her job as "teaching philanthropy." She landed in her role in development after she was mentored by a wonderful woman who worked for The Nature Conservancy; and more than twenty years later, including a stint in Advancement at Duke University, she is still thriving in the world of nonprofit fund development. Over the past two decades, Ann has had the opportunity to guide development efforts at health, human services, educational, cultural and environmental organizations. Her recent campaigns have included food banks, museums, foundations, environmental groups, churches, and children's support agencies. Ann's strength is guiding and directing campaign leadership and devising appropriate solicitation strategies for major gift prospects, with a goal of ensuring the client's success. Through Ann's guidance and expertise, many organizations are able to channel the passion of their community to fulfill their missions, thereby improving the overall well-being of the Triangle area. Ann's experience combined with her character and her ability to work seamlessly with clients has made her a tremendous asset and well-loved in the community. Ann combines knowledge with temperament; she has great knowledge of development as well as being very comfortable working within this environment. The result is a highly skilled professional who is both an inspiration and a role model for other development professionals. 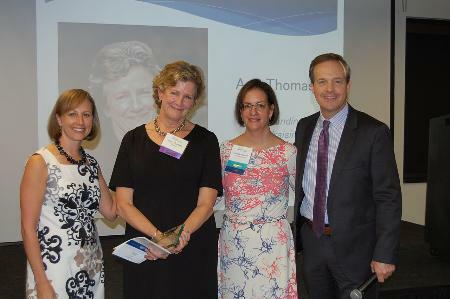 Ann Thomas has been a trusted advisor for Transitions LifeCare, founded Hospice of Wake County, for over a decade. Ann has guided Transitions LifeCare through two successful capital campaigns that have improved access to care for thousands of individuals struggling with serious illness and their families. Ann is very knowledgeable yet not overbearing. She works well with volunteers, staff, the executive team and the board of directors by enhancing teamwork and a common vision for success. Ann Thomas joined us as Senior Consultant during a critical part of our campaign. She helped us secure campaign leadership and provided valuable guidance as we solicited several key lead donors. She continues to provide value to our team through her strategic insight into our donor community. Her thoughtful and calm demeanor helps keep us on track and inspires confidence in our staff and key leadership. Ann Thomas taught me everything I know about development. Seventeen years ago, she was hired as a consultant to work with me one on one to teach me major donor fundraising. I had just been hired as head of development for a small statewide nonprofit that was unsure about whether or not development would be part of their world. The organization took a chance on me because I understood their programs, and because they thought I had the skill set to be a successful fundraiser. Ann would meet with me one on one for an hour or two every other week, and then every month. She was always just a phone call away. She helped me to think about my time management and how to NOT MAJOR IN THE MINOR. She encouraged me to get out and see people, really focus on board members and what they were saying. She was an incredible mentor, an effective counselor and teacher of development. When I began this part of my career, private fundraising accounted for 5% of the budget; in five years, with Ann's training, it was 25%. When I left that job, and moved to work at UNC Chapel Hill, Ann kept in touch with me. We would have these great luncheons once a year so she could check in. I always walked away thinking, when I grow up, I'm going to be like her: smart, savvy, great way with words. Today, I'm running development for a staff of eight; I'm the chief fundraiser for the NC Chapter of The Nature Conservancy. I am still fortunate I get to work with Ann - she's my main contact with CapDev as they help me navigate and implement our current capital campaign of $50 million. Ann Thomas has made a great difference in my life. I feel so privileged to have the job I have - connecting supporters to great missions. She helped me be the fundraiser I am today. She has been instrumental in my career development. I am so grateful to have her in my corner.